Classic Elite Yarns: Happy I Love Yarn Day! While we love yarn everyday here at CEY HQ, this is a day when we should all celebrate our craft. The Craft Yarn Council has designated October 14 as I Love Yarn Day! How are you celebrating today? By casting on a new project? By finishing up that basket of WIP's next to the sofa? Maybe by buying that special skein you've had your eye on? Here on the CEY blog, we thought we'd share what's on our needles in celebration of this day. Let us know in the comments or on our Facebook page what you're working on today! Speaking of the "Magic Sweater", Meg is working on her Elizabeth sweater in Liberty Print, color #7897, Sunrise. The twisted stitches on the cuff are an inspired choice, twisted rib is so much neater than 1x1 rib. Aren't the colors perfect for Fall? Cheryl, aka Snuzy, is on her 19th and 20th sweaters of the year and just completed Arabesque in Pirouette. She is also polishing up her Nikko cardigan in Portland Tweed and Twinings from Twist Collective in Magnolia. Tonia just completed her Abstract shawl. 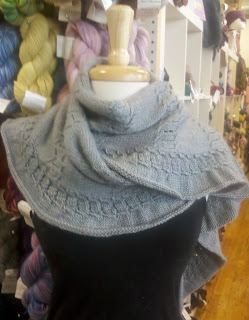 It is SO soft and elegant in Magnolia in the Granite colorway. Black Princess: another Elizabeth of my own. Silver Princess: Tonia Barry's Element cardigan. Moorland: a slouchy, comfy, oversized Grandpa cardigan--pattern improvised, but loosely based on Jared Flood's Redhook Vest.